Frederick Albert Bond was brought up in Springfield where he was a choristor at All Saints' Church. He was educated at Trinity Road School and as a teenager he saved a boy from drowning in the River Chelmer. He worked for Gripper's ironmongers in Chelmsford High Street and married in 1937. He joined the army in June 1940 and was killed in a training accident at St. Alban's in October 1942. His parents lived in Sandford Road. Dr. R. E. Wilson, who performed a post-mortem examination, stated that the cause of death was haemorrhage due to a bullet wound. The nature of the wound was consistent with the entry of a bullet which had ricocheted from a point below. Sgt. William Nash, an instructor of the course, gave evidence to the effect that the four men forming one section, of which Frederick was the leading member, had passed through a pond and the first ditch and were approaching the second. During their passage through the previous obstacles, he and the other instructors had fired a number of rounds near the men. Believing the magazine to be empty, he detached it from the gun, and discovered it contained one more round of ammunition. He replaced it and fired. 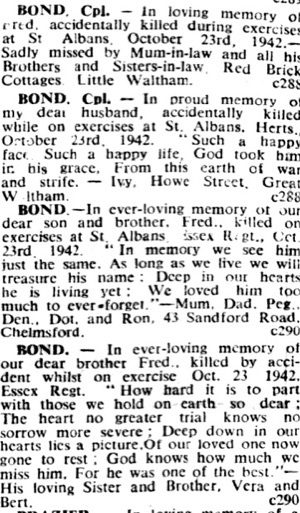 Frederick Albert Bond was born in the Chelmsford district in 1915, the second son of Bertie Bond (c1890-1963) and Florence Bond (nee Rolfe) (1893-1974). His parents had married three years earlier. 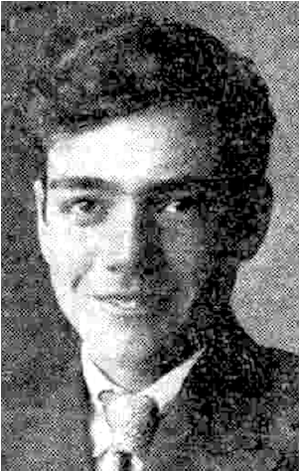 Frederick’s siblings included Bertrum Reuben Uylsses Bond (1913-1956), Frances A.Bond (born 1919), Dorothy R. Bond (born 1921), and Denis Ronald Bond (born 1932). Frederick’s uncle, Frank Rolfe (1895-1918), lost his life in the First World War and is commemorated by Chelmsford’s War Memorial. clutched him tightly about the neck, and dragged him under the water I heard Rule shout out, so I pulled off my shirt and dived in. It was with great difficulty that I separated the two boys and managed to put Powell on my shoulder. We struggled to the bank, and Rule was able to swim ashore himself. Powell was not much the worse for his adventure, but he was frightened about what his mother would say to him when he came home with wet clothes. We lit a fire, and wrapped him up in our jackets until we had dried his clothes as well as we could." At the time of the incident Frederick was described as a fine all round sportsman and a chorister at Springfield All Saints' Church for more than seven years. On 25th September 1937 Frederick married Ivy Emily Hills at St. Mary’s Church in Broomfield. He was aged 22, resident at Springfield and employed by Messrs. Joseph Gripper, ironmongers of Chelmsford. His bride was two years his senior and was the second daughter of the chauffeur Walter John Hills of Woodhouse Lodge in Little Waltham. Frederick’s father was employed as a maltster at the time.The best man was Bertram Bond, Frederick’s brother. The honeymoon was spent in Kent. By this time the men were wading through a river, and he was unaware that anything unusual had taken place until he saw Frederick half turn and cry out. He thought he must have tripped over a wire, but Cpl. Long, who was immediately behind him, shouted ‘He’s been hit’. Cpl. Long gave evidence of following Frederick over the course. After passing the first ditch, Frederick threw his arms into the air, half turned towards the witness, and collapsed in the water. The witness assured the Deputy-Coroner that there had been absolutely no ‘horse play’. Recording a verdict of Accidental Death, the Deputy-Coroner said that this was one of those unfortunate happenings that occur on such exercises. He was convinced that the manoeuvre was being carried out in an orderly manner. He expressed his sympathy with the relatives of Frederick and with Sgt. Nash. "SOLDIER ATHLETE BURIED. The funeral took place on Oct. 29 of Cpl. Frederick A. Bond, Essex Regt., of 43 Sandford Road, who was accidentally shot while on military exercise as we recorded last week. Service in All Saints' Church, Springfield, was followed by the interment at Holy Trinity. The Padre of the deceased's unit (Capt. Price, C.F. ), assisted by the Rev. H. I. Noakes, officiated. During . the service, which was largely attended, the Padre paid tribute to the deceased's Christian character, and on behalf of the unit and nimself expressed sympathy with the family in their great loss. Mr. G. C. Brown was at the organ, and the deceased's favourite hymns, "Eternal Father" and "Our blest Redeemer," were sung. Six of the deccased's comrades acted as bearers and the coffin was shrouded with the Union Jack. The funeral was' furnished by Messrs. A. J. Andrews & Son, 20 Duke Street." In June 1940 Frederick joined the army where he served as Corporal 6024591 in the 10th Battalion of the Essex Regiment. On 23rd October 1942, when aged 27, Frederick was accidentally shot and killed whilst undertaking a combined obstacle and assault course at St. Alban's in Hertfordshire. At the time his parents were living at 43 Sandford Road in Springfield.